You know those weeknights when you don’t have time to cook, but there’s nothing pre-made in the fridge or freezer? Those nights where you realize that pasta really might be the biggest lifesaver on the planet? That’s what this recipe was born out of–no time, lots of weird pantry items, and big ol’ honkin’ love of coconut milk. The best part is that the recipe made a boatload–enough for dinner, food to send with G on the plane to California, to eat on the trail, to take to a potluck, and then to eat some more. Some might get sick of eating the same thing over and over, but I’m still used to super-poor-grad-student-days (oh, I’ve eaten tater tots for dinner with PBR at the bar before…) and with a dish like this, who wouldn’t want to eat it again and again again? I’m telling you, coconut, chickpeas, kale, and pickled tomatoes are the right combo–with a splash of lemon. Bright and tart and creamy and the perfect tweener dish for these weird cool-hot-cool days between summer and fall, I’m glad it caught my eye in my Reader–many thanks to Tessa for such a great recipe! Bring a large pot of salted water to a boil over high heat. Add the pasta and cook until tender but still firm to the bite, stirring occasionally, 8-10 minutes. Drain. Meanwhile, combine the vegetable stock, coconut milk, aleppo pepper, lemon zest, and salt and pepper to taste. Bring to a boil and then immediately lower to a simmer. Stir constantly to keep it from burning. Let it reduce by 1/4 (takes 7-10 minutes). While the sauce is reducing, heat 1 tsp or so of olive oil in a skillet over medium heat. Add the kale and saute until wilted (add a splash of water if necessary to keep it from burning before it cooks all the way). Once the sauce has reduced, add the lemon juice. Adjust salt & pepper if necessary. 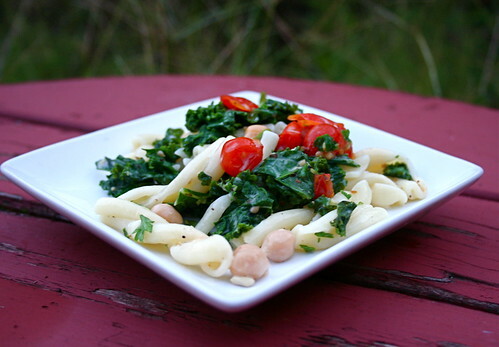 In a large bowl, combine the pasta, sauce, kale, chickpeas, and pickled tomatoes. Toss with the fresh parsley and basil. Wow, this sounds right up my alley. Guess you could also use spinach, right? YUMMM. Wow, I often turn to pasta for quick meals, but somehow it never turns out looking THIS good. That lemony cream sauce….I’m drooling just thinking about it. I am printing this recipe out and sticking it on my fridge! I never liked creamy pastas, but I’m thinking LEMON cream pasta would be awesome – especially with pickled tomatoes! Such a great idea! I once used coconut milk to make vodka sauce out of necessity, absolutely loved it, and forgot all about it. I can already imagine how well coconut milk would work in this pasta dish now, too. I love lemon in anything. I got a zester last year and have been adding lemon and lime zest to everything. This recipe looks perfect, especially since we’re in that in between stage of weather as well. Thanks for sharing! Wow, my “there’s-nothing-to-eat-in-the-house” dishes doesn’t even come close to looking this yummy! Great use of pantry items!